Preserve Your Vision With MaculaEye! It is believed that macular degeneration is a caused at least in part by accumulation of unwanted proteins, lipids and debris in the eye. TheraLife® MaculaEye formula works to improve the integrity of the retina membrane by preserving and improving permeability to optimize fluid and protein transport. 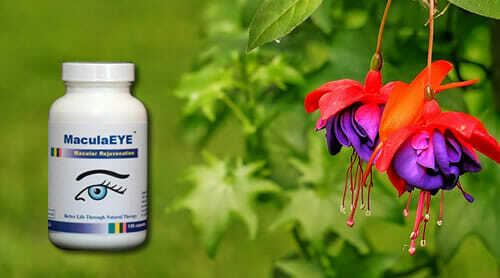 This facilitates the transport of unwanted lipids, proteins out of the eye in order to improve and prevent vision loss. Preserve your vision with MaculaEye! In some people, vision loss in AMD can occur slowly. With others, vision loss can be rapid and damaging. Age-related macular degeneration (AMD) affects the macula, the part of the eye that allows you to see fine details. This disease occurs mostly with aging, but can also happen to younger people through genetic inheritance. AMD is the leading cause of blindness with people over the age of 60. This is the most common form of AMD, between 80-90% of all the AMD cases. Dry AMD often can lead to Wet AMD – where blood vessel burst leaking blood and fluid into the eye. Wet AMD is considered an emergency and often require immediate treatment at a hospital (see section on Wet AMD below). Dry AMD can develop into Wet AMD over time. Wet AMD becomes a medical emergency and requires immediate treatment. Scientists believe that drusen bodies are lipid and protein deposits under the retina. The increase of the number of drusen bodies can be an indication of worsening of the disease progression – developing into wet AMD or total vision loss. One of the signs of Dry and Wet AMD is seeing waving lines or blocked vision areas of an Amsler Grid. The Amsler Grid is a square with many lines on it and central foci. This is a part of your comprehensive eye examination where the doctor maps out where your wavy lines and blocked areas are – to track the progression of the disease. Wet AMD occurs when abnormal blood vessels behind the retina start to grow under the macula (angiogenesis). These new blood vessels tend to be very fragile and often leak blood and fluid. The blood and fluid raise the macula from its normal position at the back of the eye. Damage to the macula occurs rapidly when bleeding starts. The person looses vision almost instantly. If this happens to you, you need to call your physician right away and get treatment. An early symptom of wet AMD is that straight lines appear wavy. If you notice this condition or other changes to your vision, contact your eye care professional at once. You need a comprehensive dilated eye exam. How does TheraLife MaculaEye Work? TheraLife® MaculaEye formula works to improve integrity of the retina by preserving and improving the membrane for optimum fluid and protein balance and transport. This mechanism will facilitate the transport of unwanted lipids and proteins out of the eye in order to prevent vision loss. In a clinical trial, patients with Dry AMD actually improved their vision over a period of 1-3 months. This was evidenced by improved Amsler Grid measurements and decreased drusen bodies. How long does it take for MaculaEye to work for me? If your vision is impaired, if you see wavy lines, or if you can’t see any lines or words, the minimum requirement is for you to stay on MaculaEye for 3 months. If you are already on MaculaEye, the maintenance dosage of 1-4 capsules per day will allow you to continue experiencing positive results and good eye health. In a clinical trial, patients with macular degeneration actually improved their vision over a period of 1-3 months. This was evidenced by improved Amsler Grid measurements and decreased drusen bodies. For those who have family members with macular degeneration and believe they may develop macular degeneration with age. A low dose of 2-4 capsules per day is recommended. Scientists believes that drusen bodies are lipid and protein deposits under the retina. The increase of the number of drusen bodies can be an indication of worsening of the disease progression – developing into wet AMD or total vision loss. High fat intake is associated with an increased risk of macular degeneration in both women and men. TheraLife® MaculaEye formula works to improve integrity of the retina by preserving and improving the membrane for optimum fluid and protein balance and transport. This mechanism will facilitate the transport of unwanted lipids and proteins out of the eye in order to prevent vision loss. In a clinical trial, patients with Dry AMD actually improved their vision over a period of 1-3 months. This was evidenced by improved Amsler Grid measurements and decreased drusen bodies. Safe, All-natural Ingredients. 2 Capsules.